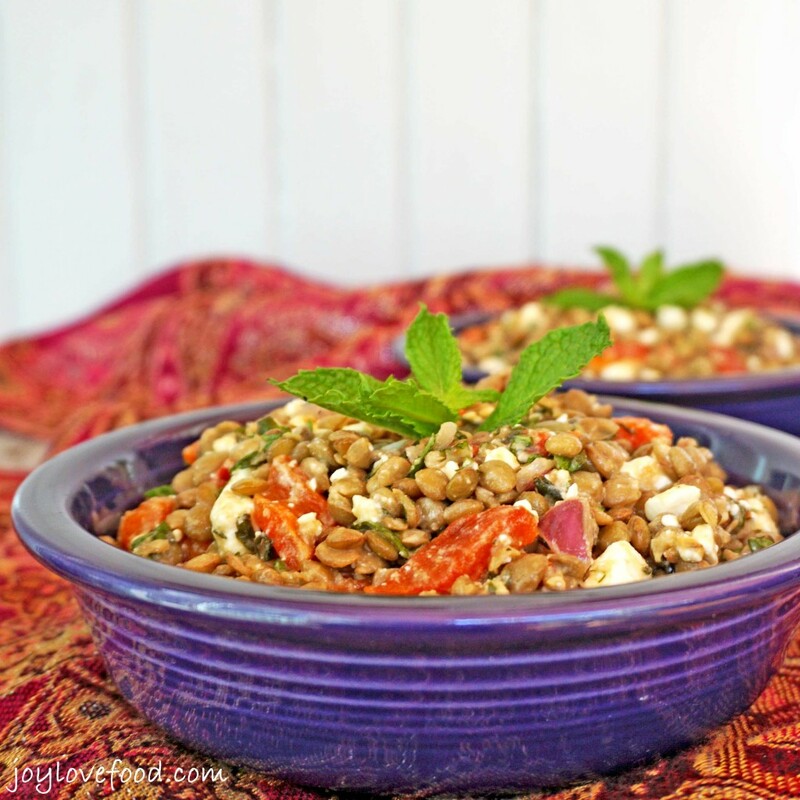 Lentil Salad with Roasted Red Peppers, Feta and Mint – a delicious protein packed salad that can be served warm or cold, great as a side dish or vegetarian main course. I love lentils, they are an excellent source of protein, iron and fiber; and they are so versatile. I usually use lentils in soups, this time I wanted to use them in a salad. Since the weather has turned cooler, I wanted to make a salad that could be served warm. 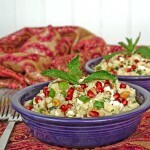 I had some fresh mint in my refrigerator that needed to be used up and I knew that it would go well in a lentil salad. So, I decided to adapt this recipe from the nytimes.com, which also includes feta cheese and red bell pepper. 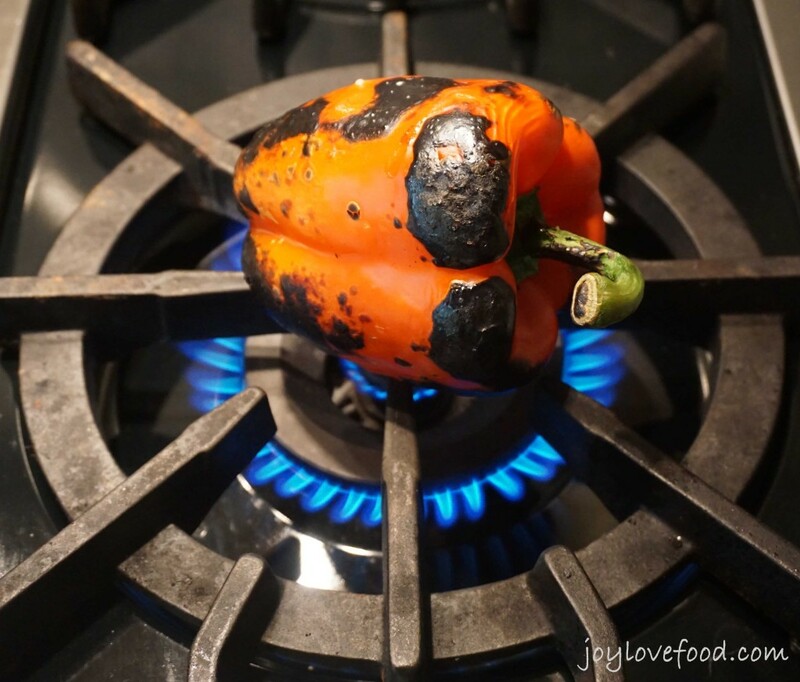 The main change I made, was to roast the red bell peppers using my new favorite technique of roasting over the open flame of one of my stove’s gas burners. I successfully used this technique to roast eggplants for my Roasted Eggplant Dip and to roast a jalapeno for my Peach and Roasted Jalapeno Gazpacho. It was so quick and easy to roast the red bell peppers using this technique. First, I placed the peppers, one at a time, directly on the open flame of the gas burner. I used tongs to grasp the peppers by their stems in order to turn the peppers and ensure they got an even char. I chopped up the remaining flesh and added it to my cooked lentils along with the chopped mint, some red onion and feta cheese. I tossed it all in a cumin spiced lemon vinaigrette. The resulting Lentil Salad with Roasted Red Peppers, Feta and Mint was so delicious and full of flavor. This flavorful Lentil Salad with Roasted Red Peppers, Feta and Mint can be served warm or cold and is an excellent side dish to a variety of entrees. We enjoyed it with chicken, it would also go well with beef, seafood or some grilled veggies. This Lentil Salad with Roasted Red Peppers, Feta and Mint is full of protein and would be great in the lunchbox along with a green salad or as a vegetarian main course. 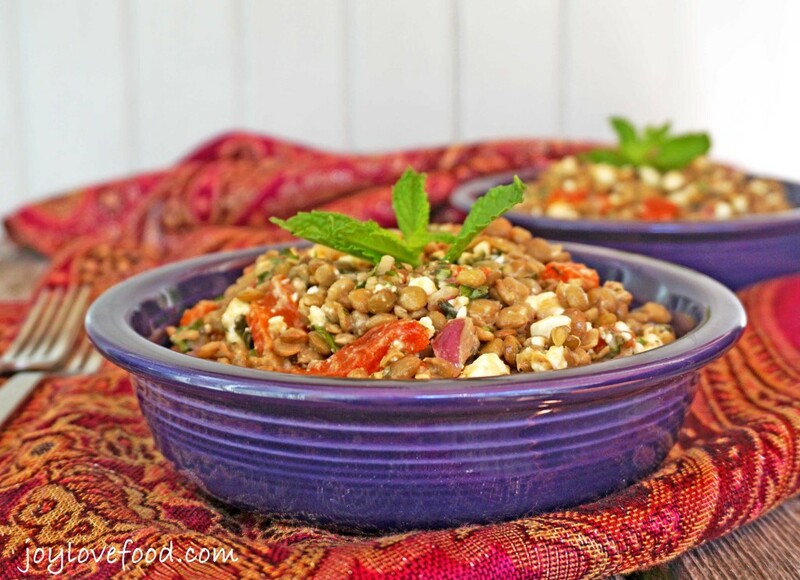 Lentil Salad with Roasted Red Peppers, Feta and Mint - a delicious protein packed salad that can be served warm or cold, great as a side dish or vegetarian main course. Place lentils in a medium sized saucepan, cover with water and set aside to soak for 30 minutes. Drain the lentils and return them to the saucepan. Add the onion, garlic, thyme and bay leaf and cover by 2 inches with cold water and place over high heat. Bring the lentils to a boil, lower the heat to a simmer and cook until the lentils are tender, but not mushy, about 30 minutes. While the lentils are cooking, char the red bell peppers. Place the red bell peppers, one at a time, over the open flame of a gas burner, using tongs to carefully grasp stems and turn peppers to get an even char, about 3-4 minutes per pepper. Transfer charred peppers to a resealable plastic bag and let cool slightly. When peppers are cool enough to touch, remove from bag and transfer to a cutting board. Using fingers, rub off charred skin of peppers, discard skin. Also remove stems and discard. Chop remaining flesh, set aside. When the lentils are done cooking, remove from heat. Discard the onion, garlic, thyme and bay leaf and drain the lentils. Place the drained lentils in a large mixing bowl. In a small mixing bowl, whisk together the olive oil, lemon juice, cumin and salt to form a dressing. Pour the dressing over the lentils and toss to combine. Add the chopped red bell peppers, mint and feta to the lentils, toss to combine. Season the lentil salad with additional salt and freshly ground pepper, if desired. Serve warm or refrigerate until ready to serve. Lentil salad can be served warm or cold. 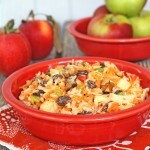 You can also roast the red bell peppers in the oven or on the grill. 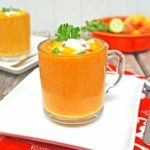 This recipe has been shared with My Legume Love Affair hosted by Herbs, Spices and Traditions, The Well Seasoned Cook and Lisa’s Kitchen. 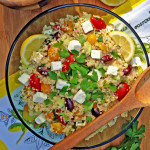 This entry was posted in Main Dishes, Salads & Sides, Vegetarian and tagged fall, feta cheese, gluten free, lentil, lentils, main course, main dish, mint, recipe, roasted red peppers, salad, side, side dish, vegetarian, warm. 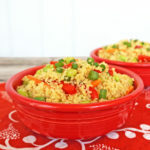 Hi Joy, Thanks for sharing this awesome recipe with MLLA, I would love to try this recipe soon. Please come and see the roundup of MLLA. Your recipe is appearing as the best recipe. Thanks so much for choosing my recipe, I’m delighted and look forward to seeing all of the recipes in the roundup! 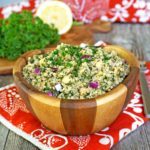 Hands down your lentil salad looks like one of the best ideas I’ve seen for lentils in a long time! Wow! that charred pepper idea rocks! I bet they added a great deal of flavor to this healty salad. lentils are so good! Great combination! Don’t have a gas stove, so would have to go out to the RV to do the flame roasting. Your salad looks lovely. Marjie@HomeAgainJiggetyjig.com/wp recently posted…THREE (3) NATIONAL CHOCOLATE DAYS! My 9 year old is a lentil fantatic and is always asking me to make him something with them. I can’t wait to give this recipe a try! I love lentils in all forms! Sounds delish! If it has feta then it is the meal for me! All the ingredients you’ve used are perfect match! What a delicious looking salad! Lentils are so filling. This is hearty enough for a full meal! i can’t wait to try this, i’m always looking for new ideas for side dishes! I’m totally jealous of your stove and that you can roast peppers, eggplants and tortillas like that! This salad would go over really well in our house. It looks great! 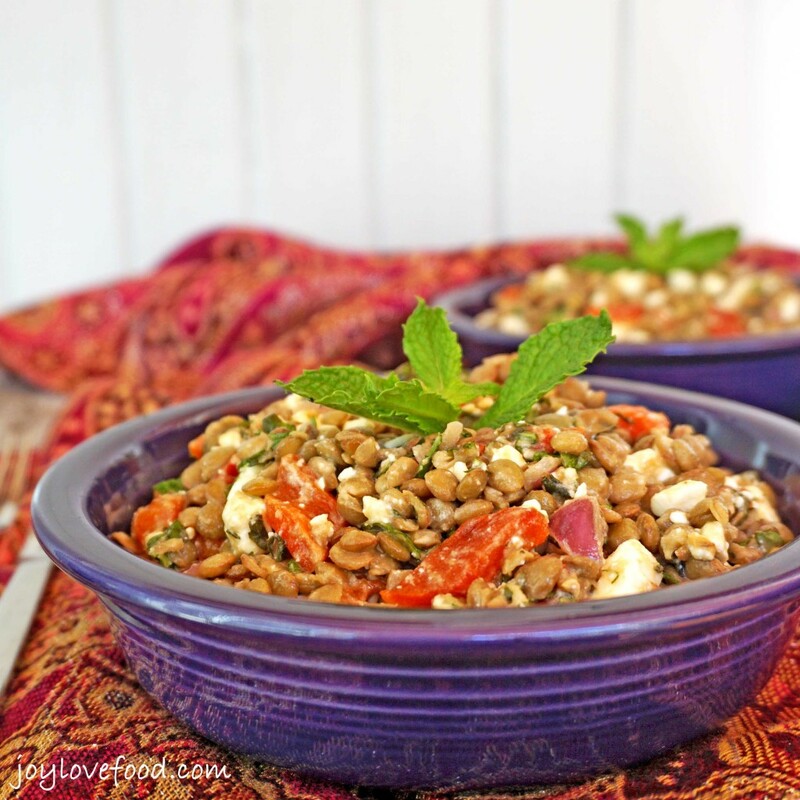 Hi Joy, I just bought a new package of lentils, have feta and ready to make this great salad, it sounds so good!! Would love to have you share your recipe this week!! Lovely looking dish! The spices makes me imagine the smell of this one. I bet its amazing! Joy this is a fantastic dish. So many things I love individually that you’ve paired perfectly. This sounds fantastically delicious, Joy! I love lentils, roasted peppers and feta! Pinned and Shared! So happy you joined us at #Omhgww! Have a fabulous week! This lentil salad sounds delicious, and I love the idea of roasting directly over the open flame. How simple. Thanks for sharing. Wonderful fresh flavors here! I could just dig right in. I saw this on Facebook and was hooked!! Saving and sharing and making soon! And what do you know? I just bought a bag of lentils last week and have been meaning to find some tasty ways to use them. Done! Can’t wait to make this! I have a bunch of lentils in the pantry because I like the idea of them, but I never know what to do with them. This is a great idea! Hi Joy, this looks great very tempting and healthy salad.